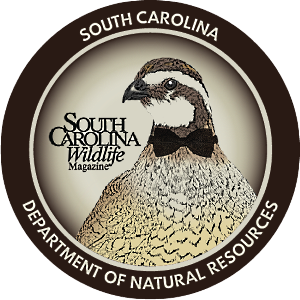 South Carolina's Avian Conservation Center in Awendaw comes to the rescue for all species of birds. The story begins long ago and far away, more than a million years ago in sub-Saharan Africa. There, early humans looked skyward and tracked the flights of vultures. When these raptors, or birds of prey, landed on the carcasses of large mammals, our forebears followed in hopes of finding their own meals. These early peoples then returned to their habitations and conveyed information about distant food locations to extended family members. "Vultures were ‘friends' in those days," writes Keith Bildstein in his book, Raptors: The Curious Nature of Diurnal Birds of Prey. Some anthropologists, according to Bildstein, think this ancient ecological relationship improved communication skills in humans. "If this is so," states Bildstein, "then scavenging raptors may have played a significant role in the development of humanity." Is it time to return the favor? Yes, says Jim Elliott, executive director of the Avian Conservation Center in Awendaw. The center was founded in 1991; it opened to the public in 2008. 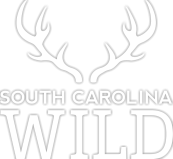 Located on a 152-acre wooded campus adjacent to the Cape Romain National Wildlife Refuge and Francis Marion National Forest, it's twenty minutes north of downtown Charleston and an hour and a half south of Myrtle Beach. Visit the center on the first day of September for International Vulture Awareness Day, when get-acquainted-with-vultures programs are featured events. You can meet a turkey vulture and black vulture, as well as a lesser yellow-headed vulture, hooded vulture and other family members, such as a marabou stork and an Abdim's stork. The center offers temporary and permanent shelter to vultures and other birds of prey - and to birds in general. It combines science, education, research, medical care, captive breeding and oiled bird rescue, says Elliott, and is the only facility of its kind in the U.S.
Its Avian Medical Clinic provides treatment to more than five hundred injured or orphaned birds of prey and other avian species each year. "We return the majority to their natural habitat," says Elliott. The center also serves as the only permanent oiled bird response facility on the Eastern Seaboard, offering what Elliott calls the best possible cleanup if an oil spill affecting birds or their habitats happens. Scientists at the center have participated in studies of avian genetics and environmental toxins, and they are now leading research on endangered and threatened birds in South Carolina, such as the state-endangered swallow-tailed kite. The Citizen Science for Swallow-tailed Kites project "raises awareness of ecological issues and encourages the public to become active contributors to wildlife conservation," says Elliott. 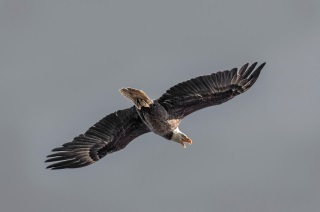 In 2017, the kite project's database logged sightings from eight states and quadrupled the number of reports compared to the 2016 season, according to Natalie Hendrickson, the project's director. In 2018, she says, "we would like to reach people who might be frequently seeing these birds at the same location. Reporting each sighting can give us insight into important swallow-tailed kite breeding and foraging habitat." The center is also home to 120 "education birds" - those that can't survive in the wild - representing fifty species from around the world. 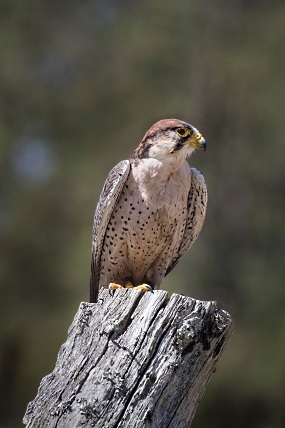 "We have one of the most significant collections of captive birds of prey in the U.S.," Elliott says. 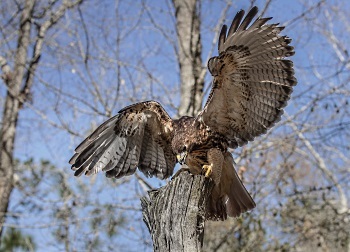 Barn owls and barred owls, great horned owls and Eurasian eagle owls all live in spacious quarters near golden eagles, tawny eagles and steppe eagles, red-tailed hawks and rough-legged hawks, merlins, Saker falcons, Mississippi kites and other raptors. Among the center's most recent, and quite beautiful, avian residents are a yellow-billed kite and a Ural owl. Both are eleven years old and were bred in captivity at the center. 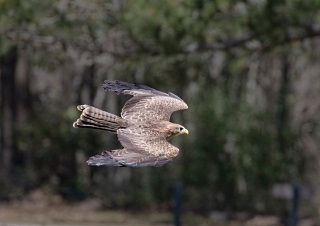 "The yellow-billed kite, a native of Africa, makes an excellent surrogate for us when we're teaching people about our native swallow-tailed kites," says Stephen Schabel, director of education. "And the Ural owl, native to Europe and northern Asia, is a parallel to our barred owl and other forest-dwelling ‘wood owls.' 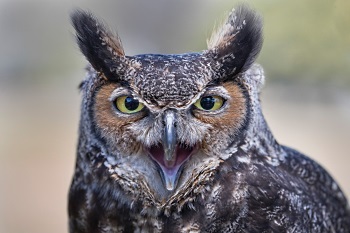 This owl is a great ambassador when we're talking about the challenges of raptor conservation around the world." The center reaches more than 20,000 children and adults each year through on-site and off-site education programs, conveying the latest information about such avian threats as contaminants and habitat loss, and "the key role these magnificent creatures continue to play as crucial environmental sentinels," Schabel says. As one TripAdvisor reviewer wrote, a road trip to the center is the "best thing you'll do all year, maybe ever. I was so excited to be so close to these beautiful creatures." Other reviewers gave top-billing to the facility's flight demonstrations. Visitors watch as eagles, hawks, falcons and owls show their stunning aerial acrobatics - sometimes mere inches away, as I discovered on a mid-March day that felt more like summer than spring. Was that a glint of sunlight just off my visor's rim? Flash! 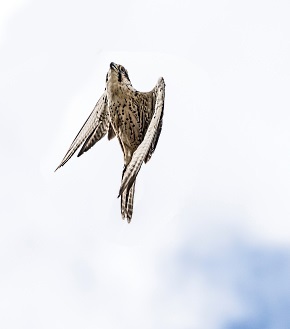 It was the lightning-fast buzz of a peregrine falcon on the wing. Fast forward six months, to mid-September. "Cancellation," a sign at the center read. The facility's popular Zugunruhefest, an annual celebration of fall bird migration (Zugunruhe is a German word derived from Zug, move or migration, and Unruhe, restlessness), was just one casualty of Hurricane Irma, ultimately downgraded to Tropical Storm Irma. South Carolina avoided Hurricane Irma's eye, but the huge storm caused severe flooding and tropical storm-force winds that left hundreds of thousands of people without power. Irma's wind gusts reached seventy-two miles per hour near Folly Beach, and the state's third-highest-recorded storm surge flooded streets in Charleston and beyond. What happened to South Carolina's birds in Irma's howling winds? For many, the outcome was tragic; for others, more hopeful. Many injured birds, or "hurricane birds," found their way, often with the help of good Samaritans, to the Avian Conservation Center. On September 9, 2017, according to Emily Davis, the center's point of contact for hurricane birds, beach-walkers saw a bird "rolling around in the waves" on the south end of Hilton Head Island near the Sea Pines Resort. The stranded bird turned out to be a Cory's shearwater, a large seabird that soars high above ocean waves. The species breeds on Madeira, the Azores, the Berlengas Archipelago of Portugal and the Canary Islands off Spain. In late summer and fall, these birds migrate over the Atlantic as far north as the southwestern coasts of the U.K. and Ireland. They return to the Mediterranean in February. That path wouldn't usually take them near the coast of South Carolina. But thanks to Hurricane Irma, that's exactly what happened last September. The Hilton Head beachgoers gently picked up the shearwater and placed it on a tall sand dune, hoping it would dry off and rest, then return to the sea. When they came back twenty-four hours later, the bird was still there; so, they contacted Chris Bowers, a Sea Pines wildlife officer. Bowers retrieved the shearwater, placed it in a box, and arranged for its transport to the Avian Conservation Center. "During Hurricane Irma, Hilton Head Island seemed to be a common place for birds to land," says Davis, "especially birds we usually don't see here in South Carolina." Power loss and mandatory evacuations "presented some tough rescue challenges," says Davis, "but we worked to get the shearwater and other compromised birds moved from Hilton Head to the center as fast as possible." Pelagic, or open-ocean, seabirds become stressed when they venture onto land; they're usually found along the coast only when they're in trouble. "Stabilizing and safely transporting them to the clinic was nail-biting," Davis says. "We were concerned for the safety of our team members, who traveled miles of roads in rough conditions, and the well-being of the injured birds." The Cory's shearwater, like the majority of the seabirds that came to the center after Hurricane Irma, was emaciated and dehydrated, a result, says Davis, "of starvation and exhaustion. We also found heavy loads of parasites on these birds." Then a second Cory's shearwater arrived soon after the first one. It faced the same challenges. Most birds have parasites, Davis says, but carry larger amounts when they become compromised by starvation and exhaustion. "Unfortunately," she laments, "neither shearwater survived." All told, the Avian Conservation Center treated seventy hurricane birds, twenty-one bird species, last fall. This includes four raptor species: three ospreys, two barred owls, two red-tailed hawks and one Cooper's hawk. "Every bird admission was a little different," says Davis. "Like a human trauma facility, we were and always are ready for whatever comes through the door." Sometimes what arrives is good news. A resident of Bluffton vacated his home during Irma, then returned and began to pile up debris and downed tree limbs in his backyard. As he neared a fence line, he spotted an injured, large brown bird. He thought the bird might be a double-crested cormorant, a common bird along South Carolina's coastal waterways. 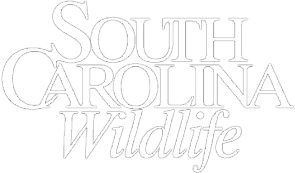 The Bluffton resident called a local wildlife rehabilitator, who captured the bird and initially evaluated its health. The rehabber sent photos to the center, where staff members determined that it was, in fact, a juvenile brown booby. This large, long-winged seabird flies above tropical seas around the world. What was a bird of the tropics doing in South Carolina? "The booby had been blown off-course by Irma," says Davis. Thin and dehydrated, it was transferred to the center, where it stayed for twenty-one days. "It became a favorite patient of many of our medical staff members," says Davis. "It was always eager to eat, and it was very observant of our movements and care procedures. To make its stay more comfortable, it was even introduced to a laughing gull also undergoing treatment." At the end of the booby's three weeks there, it was again transferred, this time to the Marine Science Center in Ponce Inlet, Florida, where it was returned to the wild. As far as anyone knows, the brown booby of Hurricane Irma is again winging its way above tropical waters. "And that," sums up Elliott, "is what the Avian Conservation Center is all about: saving birds and protecting their habitat. Their habitat is our habitat." As our ancient ancestors in Africa learned, birds have much to teach us about survival - often our own. Ecologist and award-winning science journalist Cheryl Lyn Dybas lives in Virginia, and frequently visits South Carolina.